Cambodia cuisine is all about the contrasts, bitter and sweet, salty and sour, cooked and fresh. Check out the top must-try Cambodia dishes during your vacations. The national dish of Cambodia, Fish Amok is well-known for its beautiful presentation and fragrant flavors. 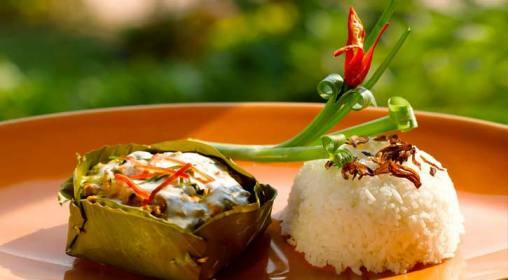 The curry is made from aromatic spices mixed with coconut milk, and then steamed with mild white fish in a banana leaf. The fish curry can range from saucy to creamy depending on the restaurant visited. This popular breakfast dish is made from bbq pork , and while no two recipes are ever the same, all include pork marinated in garlic, soy, and coconut milk slowly grilled over charcoal. The result? 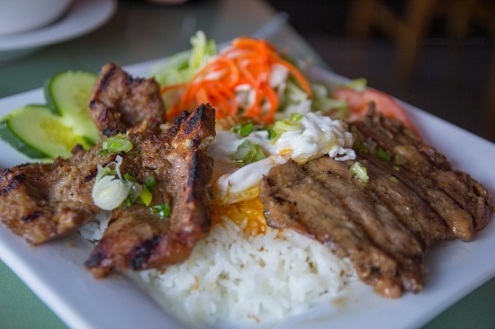 A smoky, caramelized, scrumptious meal, served with rice and ginger-flavored mango salad. Less spicy than the curries of Thailand, Khmer red curry also contains a coconut milk base without the added ingredient of chilies. 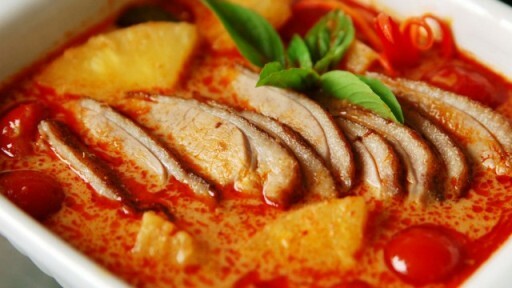 The ingredients for the curry include a variety of vegetables, lemongrass, and chicken, beef, or pork. As a result of French influence during the Indochinese Empire, the curry is usually served with bread. It is common for locals in Cambodia to consume fruits at various stages of ripeness, and from this tradition, green mango salad was born. 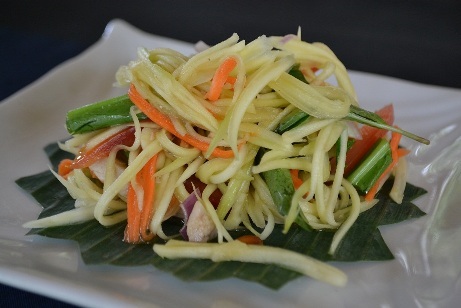 Although similar to Thai green papaya salad, the Cambodian version is more refreshing and citrusy without the spice. 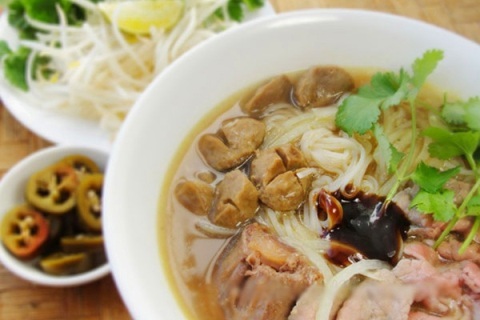 Known as Khmer Noodles, this popular breakfast dish can be found being sold in the streets off of little old women carrying it on baskets held together by a pole. The noodles are made from rice, and topped with a fish-based green spiced gravy. Lastly, heaps of green herbs are used as a garnish. Phnom Penh streets are full of street stands serving cha houy teuk to children after school. This Khmer dessert is created from sweet jelly, derived from agar agar, a type of seaweed, and is usually a bright green or pink color. 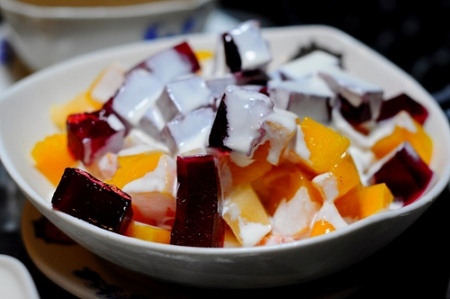 The jelly is then combined with sago, mung beans, and coconut cream, and then served over a big scoop of shaved ice. Perfect for those hot and humid days! 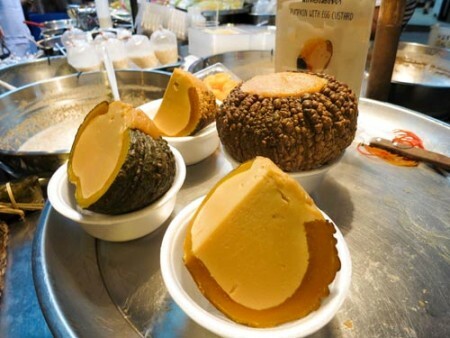 This Khmer dessert is made by scooping out pumpkins and then filling them with a mixture of egg yolk, palm sugar, and coconut milk. The pumpkins are then either baked or steamed, and served over a scoop of shaved ice.